Are you or your child struggling with reading difficulties, dyslexia, or a specific learning disability? Are you looking for a program that will provide you or your loved one with the treatment and encouragement needed to conquer a learning disability or literacy deficiency? There is hope, and you will find it here. The Hudson Literacy Clinic (HLC) is a diagnostic/remediation center serving the communities of Hudson, Rigaud, St. Lazare, and Vaudreuil-Dorion, as well as Montreal and its surrounding areas. We are not a generalized tutoring service. 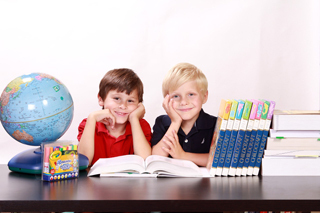 We specialize in the treatment of reading, spelling, writing, and comprehension difficulties, and offer remediation services specifically intended for individuals who struggle with literacy and need an intervention program that is proven effective and has quantifiable results. Many well known “franchise-type” after school programs tend to use a catch-all, worksheet-based, cookie-cutter system, and more often than not, do not employ qualified teaching personnel. "One-size-fits-all" programs such as these may be helpful to reinforce already acquired skills through practice, but do not address the underlying reason(s) why a student may have encountered a major “road-block” in reading skills acquisition. By contrast, the HLC staff includes experienced teachers and trained clinicians who provide intensive one-on-one or small group remediation that is multisensory in nature and based upon the Orton-Gillingham Approach. Teaching staff at HLC are knowledgeable in the areas of language based-learning difficulties and early literacy intervention, have well over twenty years of solid teaching experience, and are active members of the International Dyslexia Association and the Montreal Center for Learning Disabilities! Services at the Hudson Literacy Clinic are designed to meet the needs of families living in Hudson and St. Lazare areas and those living in the surrounding communities. We strive to enhance the development of literacy skills in school aged children and young adults, and can also meet the needs of adults seeking to improve their literacy skills. Programs implemented at HLC are backed by historic and cutting-edge research and are specifically intended for any individual wanting to improve their reading, spelling, and writing skills, as well as those coping with dyslexia and other language-based learning difficulties. As per our motto, the Hudson Literacy Clinic believes that “Reading Opens Doors.” We are determined to give you or your child the tools needed to succeed academically and beyond!